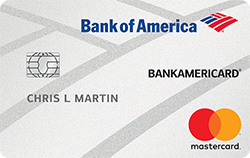 The BankAmericard® credit card is a low interest rate card from Bank of America®. It's interest rate is 15.24% - 25.24% Variable APR on purchases and balance transfers. In fact, it offers the lowest interest rate of any consumer credit card from Bank of America®. If you have been carrying a credit card balance for a period of time, you know how fast interest adds up. This card helps you save money each month if you qualify for a lower rate. But wait, there’s more! New cardholders get 15 billing cycles at 0% APR on balance transfers. To qualify for 0% APR, balance transfers must be completed within 60 days of opening a new account. This card is great for both paying off high interest debt and improving your credit score. Taking advantage of the 0% APR period to pay off your debt will do a lot more for your finances than saving on interest. Paying off credit card debt also improves your credit score. Coupled with a solid on-time payment history, paying off your credit card debt will ensure you get the best interest rates available and can be approved for nearly any credit card or mortgage loan. Cardholders can also view their FICO® credit score and track their progress for free within the Bank of America® mobile app. If looking to save with lower credit card interest rates and 0% introductory APR, this is one of the best options available today. 0% APR Intro Period – New cardholders pay no interest on balance transfers for 15 billing cycles after opening a new account. The fee for balance transfers after the first 60 days is 3% (min. $10). Smart Tip: Take advantage of the 0% APR period to get out of debt for good. Divide your total balance by 15 to calculate an approximate monthly payment needed to get out of debt before interest kicks in. No Annual Fee – Not only can this card save you big on interest charged by other cards, you don’t have to pay any annual fees to do it. Keep this card open as long as you want without paying an annual fee. FICO® Score – As a BankAmericard® credit card cardholder, you get access to your real FICO® credit score at no extra charge. Access your score online or through the Bank of America® mobile app. Smart Tip: You can get your credit report for free each year by law at annualcreditreport.com. However, that does not include your credit score. The credit reporting bureaus try to upsell you a product that costs $10-$20 per month to get your credit score, but with this card, you can get your credit score for free. Low Interest – Many credit cards charge in excess of 25% APR for even the best customers. This card offers the lowest rate of any consumer credit card from Bank of America®. Pay no interest if you pay your bill in full each month. Otherwise, pay 15.24% - 25.24% Variable APR on purchases and balance transfers based on your credit history and market interest rates. Fraud Protection – Cardholders are never liable for fraudulent transactions. If suspicious activity occurs, Bank of America® automatically blocks the transaction and informs you of the activity. If a bad guy gets away with a fraudulent transaction, you have $0 liability with this card. ShopSafe® Security – Using your card online is a worry free experience with ShopSafe®. Generate a temporary card number so you never have to enter your real account number when shopping online. EMV Chip – Use the card at secure chip reading terminals around the world. Some sales kiosks in Europe, Canada, and other parts of the world require a chip for any transaction. Overdraft Protection – Link your BankAmericard® credit card to a Bank of America® checking account for overdraft protection. Never worry about an embarrassing bounced check or overdraft fee with overdraft protection in place. There is no fee to have the service enabled. Transfer fees apply when used. Digital Wallets – This card is compatible with Apple Pay, Android Pay, and Samsung Pay. Just register your card in the app and pay securely by hovering your phone above participating card terminals. Text Banking – Forget about logging into complicated websites and using apps to get quick updates on your account. Just send a text message to Bank of America® and get the info you need in seconds. Take advantage of this card’s low standard purchase APR automatically with any purchase you make. This card is notably simple and easy to use. There are no complicated rotating categories to worry about. Just use the card for your everyday purchases to take advantage of card benefits. To enjoy the 0% APR introductory period with no balance transfer fee, balance transfers must be completed within 60 days of opening a new account. To transfer a balance after that there is a fee of 3% with a minimum of $10. For example, a $3,000 balance transfer made would require paying a $90 fee. At the end of the introductory period, the card’s standard interest rate applies. The current rate is 15.24% - 25.24% Variable APR on purchases and balance transfers. Rates can change at any time and are based on your credit history and current market interest rates. Balance transfer savings depend on the total amount transferred and interest rates charged by other cards. For an example, let’s look at a $5,000 transfer from a card charging 24% APR. In this case, you would pay a $150 transfer fee. At 24% APR, interest on the card is around $100 per month. You would break even two months after completing the balance transfer and taking advantage of 0% APR. There is a 0% introductory period for 15 billing cycles on purchases. After that a variable APR of 15.24% - 25.24% on purchases, based on your creditworthiness will apply. These APRs will vary with the market based on the Prime Rate. 0% for 15 billing cycles on balance transfers. After that, the APR will be 15.24% - 25.24% Variable on balance transfers, based on your creditworthiness. This APR is effective at the end of the 15 billing cycle 0% APR period. To qualify for 0% intro APR, balance transfers must be completed within 60 days of opening a new account. Your due date is at least 25 days after the close of each billing period. Bank of America® will not charge you any interest on purchases if you pay your entire balance by the due date each month. ATM, Over-the-Counter, Same-Day Online and Cash Equivalent Cash Advances: Either $10 or 5% of the amount of each transaction, whichever is greater. Foreign Purchase Transaction: 3% of the U.S. dollar amount of each transaction - made in a foreign currency or made in U.S. dollars if the transaction is made or processed outside of the United States. Wire Transfer Purchase: Purchasing a wire transfer from a non-financial institution results in a fee of $10 or 5%, whichever is greater. While this card does not offer any travel or cash back rewards, is it a great option for someone looking to consolidate balances and save money with a 0% APR introductory period. Among cards with a 0% APR period, many limit that to 12 months. This card beats them by three billing cycles, making it a great choice for balance transfers.